Howdie my friends, how was your weekend? Mine was lovely, a wonderful mélange of activities and rest. If you follow me on Twitter you might have read my gripe about one of my latest DIY projects. I am still working on the little Guest room and although I am sure it is going to turn out ok, not everything is going right the first time. I will share in due time. The other part of my weekend was spent rummaging on various Flea Markets. The season for “Brocante”, “Bric-a-Brac”, or “Vide Greniers” is in full swing here, and I dove in, head first. Somehow this weekend seemed to be a weekend of Ephemera finds. I found paper goodies everywhere. Although my first find was definitely not a paper one. I found a bunch of vintage silverware for a good price. A price that makes me feel that it is ok to craft with these beauties. So expect to see them again (although probably not soon). My next find was something that definitely shouldn’t be judged by its cover. It was a true vintage photo album with beautiful graphics. It definitely shows the signs of its age and the pages have been damaged by dampness, but when something is that old, you hardly would find it in mint condition. Not all the pages were filled but I still found a lot of beautiful Cabinet Cards inside. This is the page with my favorite photo. Isn’t that little baby not absolutely adorable? Not everything I found was French. I also found this cute old Dutch card game. It contains a complete set of cards that depict the life of a cute couple of gnomes. They are drawings by Rien Poortvliet a Dutch artist that became famous for his artwork about the life of gnomes. He invented this whole world, complete with minute details about the life and adventures of gnomes. Looking at these pictures I feel that there is some collage art in my future depicting gnomes. Anyone want to join me in that and maybe do some kind of swap? My next find is very Dutch too. A lovely tin, complete with little farm girl in wooden shoes and with tulips at her feet. Aren’t these colors lovely! Ok back to French Ephemera. Because I found more. Like a whole set of the most beautiful old photographs. And I was pretty happy about finding the old photo stand too. I see modern, quite ugly ones all the time, but this old, rusty one, is very special to me. Look at that rusty base. Isn’t it the best. What is it about rust that becomes so attractive when you find it in the right place and in the right amount. My last find is another card game. This time a French one in more than one ways. Because it is a French game designed to teach children French words. The drawings are so cute, really who wouldn’t want to learn French in that way. Ok ladies this concludes my tour of my French Flea Market Finds. I hope you had fun browsing with me. And now that the weekend is over, I am back to my vacation DIY. Hopefully I will be able to make a big dent in my guest room and bedroom plans. I’ll keep you posted. But before I go. A special message for all fellow lovers of vintage. Have you seen Miss Mustard Seed’s giveaway. She is having a special Miss Mustard Seed In A Box Giveaway to celebrate here 2000 follower. It is an amazing giveaway, take it from me you have to enter!!! And if you don’t follow her yet, you should, she is awesome and soon will hit 3000, I know. You got some wonderful things. Love the album full of vintage photos. Oh my word! I can't believe someone would get rid of that beautiful, old photo album…although I suppose that with something that old and in Europe it could have been misplaced over the years. Adorable stuff! Love the gnomes! And the album especially! It has been a long time since I found a flea market or open air market looking as inviting s your photo. Your finds are wonderful and inspiring me to take a closer look at some ephemera. Still hard for me to think of the gnomes as Vintage. Lovely! Great finds! Wish I had a nice flea market nearby! Oh My WOW on the photo album! Such a treasure! 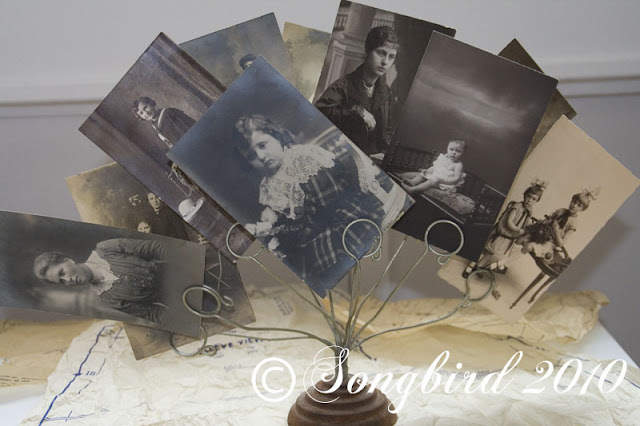 Great finds….I'm loving the rusty photo holder and album with the vintage photos. Those old photos are so gorgeous!!! The photo holder is the perfect display for them…looks you had some happy hunting!!! What beautiful things you found. I would love to go to French flea market. That photo album made me gasp. I love stuff like that. What great finds! I am headed to the Endless Yardsale this weekend and cannot wait to see what goodies I happen upon. Wow what great finds, I have also been looking for a photo holder like yours. The new ones are ugly!! I wish I could go to a french flea market. I so love the photo/card holder. These catch my eye whether they are old or new. Lots of fun finds here. I wish I could go with you to the flea markets. Everything is ohhhh Ahhhhh. The children's word cards are wonderful!! That celluloid photo album! Those French cards! The photo stand…WOW! ik wil ook. alleen zonder auto niet altijd makkelijk. laat me iets weten als je wat gaat doen met die kabouter swap. belle chine ,ces petites cartes sont vraiment charmantes..
Oh my Marianne – that old photo album is a scoop. You really got some great finds – love those old photos and photo stand too. Leuk zo'n album vol met vintage foto's Marianne ! Oh! I love it all. Super treasures! Oh my gosh that photo album is a treasure. You really scored big time on that. I love that rusty photo holder..and the photos you found..doesn't it just make you wonder who these people were and why their families didn't keep them? What fun things you found! I love all the old photos and the photo holder. I can think of several fun ways those French cards can be used. Have a great time playing with all your goodies. Yummie, yummie, wat een heerlijke vondsten! Weet gewoon niet welke ik het leukst vind, allemaal dus maar! Het album met foto's is echt een gelukje, net als je franse kinderspelletje. Superschattig! Ik heb m'n hart op kunnen halen in België, moet zeggen dat de rommelmarkten hier in de kop van N-H echt niet veel voorstellen, echt allemaal troep, of het zijn handelaren die de prijzen wel weten te vragen. Maar goed, ik kan weer teren op een paar weken brocante jagen! Ik wens je een hele fijne week! Met wie weet nog meer prachtige vondsten! The album and the photo stand are particularly wonderful finds imo. Oh my, such wonderful finds! Wish I could come shop with you sometime! Looks like you had a wonderful time, and got some wonderful finds. I found you through Southern Hospitality, and I am now your newest follower! I love those gnome cards! We had one of his illustrated books growing up – he really did create a wonderful world. That flatware is beautiful too! Great finds! I love old photos of anonymous folks. What a great find in that album! People somebody at some point loved. You've outdone yourself with these finds for sure! I want to pack up and go visit! I took a second and third look! I think you had everyone at "French Flea Market" :). You found some fantastic and fun items!